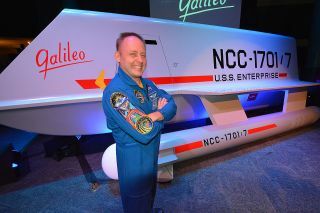 NASA astronaut Mike Fincke poses with the newly-revealed “Star Trek” Galileo shuttlecraft prop at Space Center Houston in Texas, July 31, 2013. HOUSTON — The first shuttlecraft from the original 1967 "Star Trek" television series has landed at a real-life space center for its final away mission. “Star Trek” superfan and prop restorer Adam Schneider (left) applauds as actor Don Marshall is introduced to unveil the “Galileo” shuttlecraft at Space Center Houston in Texas, July 31, 2013. Joining Marshall for the lights-and-fog-assisted reveal were actors Robert Picardo ("The Doctor" from "Star Trek: Voyager"), Sylvester McCoy (the seventh "Doctor" from "Doctor Who"), Tracy Scoggins ("Captain Elizabeth Lockley" from "Babylon 5") and Gil Gerard ("Captain William Buck Rogers" from "Buck Rogers in 25th Century"), among other sci-fi stars. The shuttlecraft's eventual permanent exhibit in Space Center Houston's "Zero-G Diner" will highlight how science fiction has inspired real-life space explorers and workers. "This is one of our ideas as to what a shuttle should be," NASA astronaut Mike Fincke told SPACE.com after the unveiling. "I had a chance to fly on a real space shuttle, so there is a connection. And it is an exciting connection because now it can be made by everyone." "Come to Space Center Houston, be inspired and who knows what some of these kids who are going to be inspired what they are going to build in the future," said Fincke, who also had the chance to play an engineer in the final episode of the "Star Trek: Enterprise" TV series in 2005. “Star Trek” superfan Adam Schneider and actor Don Marshall watch as the “Galileo” shuttlecraft is revealed at Space Center Houston in Texas, July 31, 2013. In the Jan. 5, 1967 episode, the Galileo shuttlecraft was shown transporting Boma (Marshall), Science Officer Spock (Leonard Nimoy) and Dr. McCoy (DeForest Kelly), among others, to the surface of the planet "Taurus II" on a mission that would leave the spacecraft in need of repair. As it turned out, the Galileo suffered even more damage in the decades that followed its seven televised space adventures. It wasn't until June 2012 when 'Star Trek' superfan Adam Schneider bought the degraded prop through an online auction for $61,000 did the Galileo's fate begin to turn around. Working with "Star Trek" blogger Alec Peters, Schneider and the team at Master Shipwrights in New Jersey used photos and tips from fans of the show to restore the shuttlecraft to its original screen appearance. The repairs, which took nine months under the guidance of craftsman Hans Mikatis, were completed in June when the Galileo was trucked from the Garden State to the Lone Star State for public display. "If you had told us a year and a month ago that we would have been able to obtain this thing [and] that we'd be able to figure out how to fix it ... and that we'd be able to donate it to Space Center Houston, the home of America's manned space program, I would have said that's just fabulous," Schneider said. Now part of Space Center Houston's collection, the Galileo shuttlecraft will be displayed in the same building as some of NASA's most historic spacecraft. "The addition of Galileo adds to the rich history of space exploration as it pays tribute to the way science fiction ignites our imaginations and has inspired generations of innovators," said Richard Allen, president and CEO of Space Center Houston. "Galileo will join the ranks of many other inspiring exhibits at Space Center Houston, including the recent space shuttle mockup addition and the biggest expansion in our history, the 747 Shuttle Carrier Project." During the same visit to see Galileo, Space Center Houston guests can see the Apollo command module "America" that flew astronauts on the last mission to the moon, the two-man Gemini 5 spacecraft and "Faith 7," Gordon Cooper's Mercury capsule that 50 years ago this past May lifted off on NASA's last one-man mission. The newly-unveiled “Star Trek” Galileo shuttlecraft prop as seen on display at Space Center Houston in Texas, July 31, 2013. But the Galileo is not Space Center Houston's first foray into exhibiting science fiction artifacts. Previous temporary exhibits have included costumes and props from the "Star Wars" movies, including a full-size Starfighter vessel and an original prop lightsaber that was flown aboard the real-life space shuttle. "As Galileo takes it place at Space Center Houston, it does so to capture the imagination and inspire the next generations,” Allen said. “It will serve as a tool with which we can imagine endless possibilities." This article was corrected to reflect that Capt. Kirk was not part of the Galileo crew during the "Galileo Seven" episode.